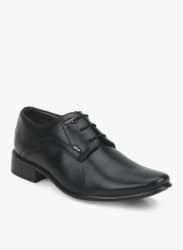 Leave a lasting impression on your colleagues wearing these black coloured formal shoes for men by Lee Cooper. Featuring leather upper, these lace-ups are durable and comfortable to wear. Furthermore, the tpr outsole will ensure a firm grip to your feet.